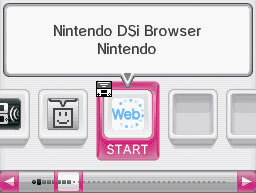 The Nintendo DSi Browser comes pre-installed on all Nintendo DSi and Nintendo DSi XL systems, with the exception of the earliest versions of the Nintendo DSi system. The program can also be downloaded for free from the Nintendo DSi Shop. The Nintendo DSi Browser takes you online through your wireless home Internet connection or through any supported hotspot access point. The dual screens and Touch Screen features of the Nintendo DSi make for a unique and portable web surfing experience. A wireless broadband Internet connection is required. If you have Nintendo DSi Browser and you would like to restrict access to browsing the Internet, this can be done through the Parental Controls settings of the system. Important: The Nintendo DS Browser made for the Nintendo DS (original) and Nintendo DS Lite is not compatible with the Nintendo DSi. The only version that is compatible with the Nintendo DSi is the Nintendo DSi Browser pre-installed on all Nintendo DSi and Nintendo DSi XL systems or available from the Nintendo DSi Shop (the earliest versions of the Nintendo DSi system did not have the Nintendo DSi Browser pre-installed).